You can add tables to your Help Center articles, and customize their properties, by clicking the Table icon in the article editor toolbar, and selecting your table options. 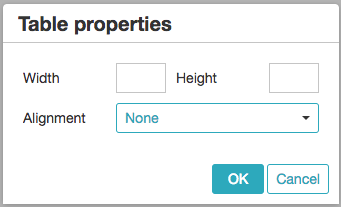 The table formatting options available depend on whether or not you are allowing unsafe HTML in Help Center pages. Open the article in the Guide article editor, and place your cursor where you want to add the table. Click the grid to add the table to your article. 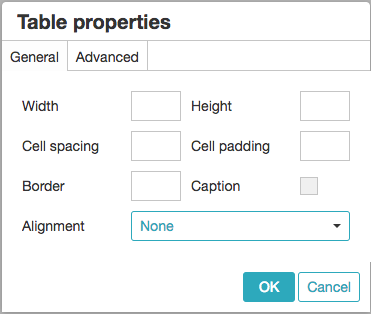 Once the table is added to your article, you can add content by clicking inside a cell and inserting text or images. 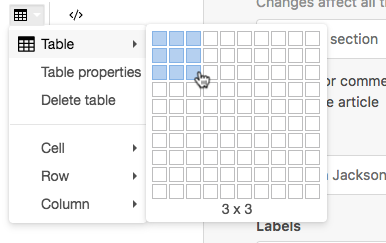 You can also format the width, height, text alignment, and other table properties. Select the table in the article. The Advanced tab allows you to update the style, border color, and background color. When you've made your formatting changes, click OK.
What are we supposed to enter in border? A color? A format? Anything else? Typically, you would enter how many pixels thick you wish for the border to be, so it will be a numeric value. Is there any way to format a particular cell (rather than the whole table) aside from diving into the html? For instance, if I want to provide a background color for a header row or highlight specific rows of a table with a background color? This can be done either by amending the table's cell properties - by accessing the Advanced tab, or by editing the HTML code of the article. Thanks Alexander, it did a bit. Another question ... when selecting font color it doesn't allow me to pick white. If I'm using a dark background I like to use a white font. Is there a way to make it white? You would need to change the font color in the CSS in the advanced tab or acessing the HTML code of the article. How do I make the table borders show? HI Katie, This one should work. Just copy and paste this code at the end of your Help Center theme CSS file. Hi Fabien! That's really great feedback! If you don't mind taking a couple minutes, it would be great if you could add your suggestions to this thread in our Product Feedback topic! How can I set the color of my article's table border or background?